As if more than £10,000's worth of drum gear wasn't reason enough to enter our 25th anniversary competition, check out the video below to see one of the prizes in action. The clips show marching drum extraordinaire Simon Mellish trying the Carrera Terrier kit out. 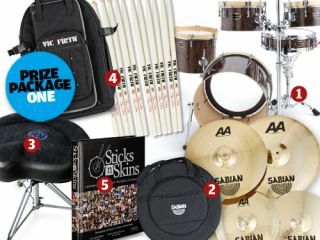 You can win the kit (which carries the serial number 001) in this month's Rhythm. The kit is one of a host of awesome prizes on offer in our anniversary issue competition. Pick yourself up a copy of Rhythm 181 or order the issue from www.myfavouritemagazines.co.uk for my details.